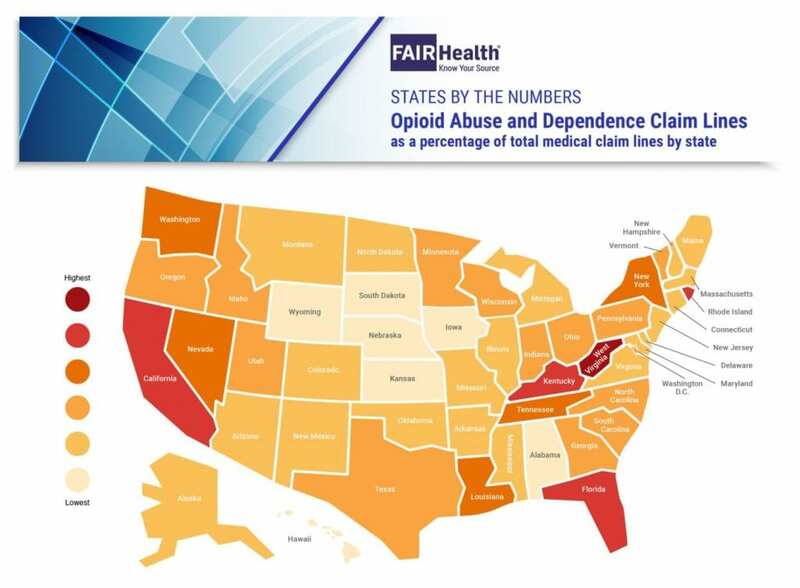 NEW YORK, NY–October 1, 2018–FAIR Health has released an online interactive heat map at fairhealth.org/states-by-the-numbers/map showing new findings on opioid abuse and dependence diagnoses and procedures for each of the 50 states and the District of Columbia. The innovative visualizations, issued in conjunction with a white paper on regional and state variations in opioid-related treatment, allow Americans throughout the country to see a snapshot of the opioid crisis in their particular state or across states. A national, independent, nonprofit organization dedicated to bringing transparency to healthcare costs and health insurance information, FAIR Health created the visualizations by drawing on data from its database of more than 26 billion privately billed medical and dental claim records dating back to 2002–the nation's largest repository of private healthcare claims. Using that database, the national heat map represents opioid abuse and dependence claim lines as a percentage of total medical claim lines by state in 2017. The colors of the states reveal which states have the highest or lowest percentages. FAIR Health is a national, independent, nonprofit organization dedicated to bringing transparency to healthcare costs and health insurance information through data products, consumer resources and health systems research support. FAIR Health possesses the nation's largest collection of private healthcare claims data, which includes over 26 billion claim records contributed by payors and administrators who insure or process claims for private insurance plans covering more than 150 million individuals. FAIR Health licenses its privately billed data and data products–including benchmark modules, data visualizations, custom analytics, episodes of care analytics and market indices–to commercial insurers and self-insurers, employers, providers, hospitals and healthcare systems, government agencies, researchers and others. FAIR Health also holds separate data representing the experience of all individuals enrolled in traditional Medicare from 2013 to the present (as well as Medicare Advantage enrollees represented in its private claims data). Certified by the Centers for Medicare & Medicaid Services (CMS) as a Qualified Entity, FAIR Health receives all of Medicare Parts A, B and D claims data for use in nationwide transparency efforts. FAIR Health can produce insightful analytic reports and data products based on combined Medicare and commercial claims data for government, providers, payors and other authorized users. FAIR Health has earned HITRUST CSF and Service Organization Controls (SOC 2) certifications by meeting the rigorous data security requirements of these standards. As a testament to the reliability and objectivity of FAIR Health data, the data have been incorporated in statutes and regulations around the country and designated as the official, neutral data source for a variety of state health programs, including workers' compensation and personal injury protection (PIP) programs. FAIR Health data serve as an official reference point in support of certain state balance billing laws that protect consumers against bills for surprise out-of-network and emergency services. FAIR Health also uses its database to power a free consumer website available in English and Spanish and an English/Spanish mobile app, which enable consumers to estimate and plan their healthcare expenditures and offer a rich educational platform on health insurance. The website has been honored by the White House Summit on Smart Disclosure, the Agency for Healthcare Research and Quality (AHRQ), URAC, the eHealthcare Leadership Awards, appPicker, Employee Benefit News and Kiplinger's Personal Finance. FAIR Health also is named a top resource for patients in Elisabeth Rosenthal's book, An American Sickness: How Healthcare Became Big Business and How You Can Take It Back. For more information on FAIR Health, visit fairhealth.org.